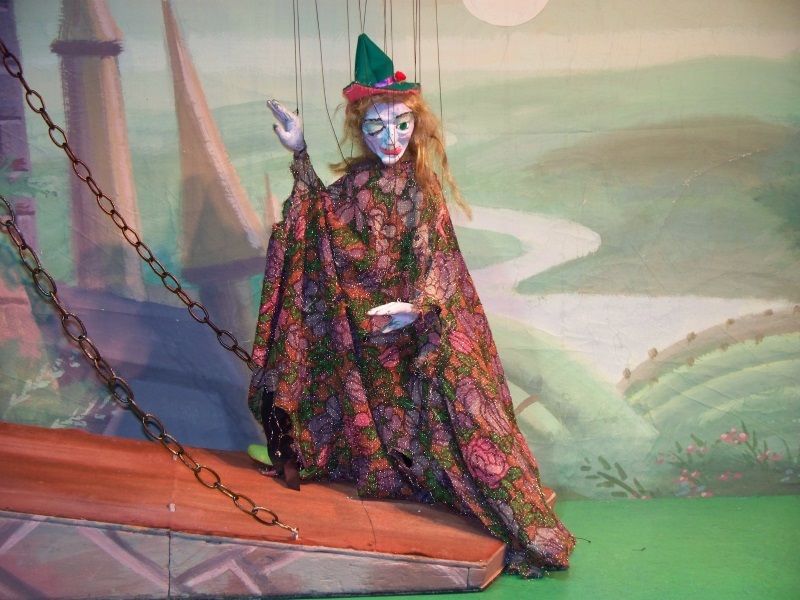 Keeping in their tradition of presenting old fairy tales, Puppetworks Theater in Brooklyn is currently showcasing their version of Sleeping Beauty. Providing the right mixture of magic, adventure and romance, the performance is a great way to add some color to a dreary winter afternoon. The adaptation of the story holds all the major themes and characters that we are familiar with, ranging from Princess Aurora to the Fairy God Mothers. An interesting twist to their story is that the curse upon the Princess is caused by a prick from the thorns on a rose, rather than on a spinning wheel. This then eliminates a conversation you will have to have with your child about what a spinning wheel actually is and how one would injure themselves on it. The story does include a rescue and an awakening kiss by a Prince, after a valiant sword fight with a dragon. For those children who are not quite into “Princess” entertainment, the show does offer plenty of slapstick moments as well as sword fighting and suspense. There are plenty of jesters and pratfalls that elicit laughs. Wutzel, the Evil Fairy, does have her moments that may frighten more sensitive children, however, Puppetworks does a great job of offsetting her villainy with some goofiness. The play is divided into multiple scenes, so there are moments when the curtain closes, music plays and the scenery is changed. These breaks in the show are great if you have to rise and use the restroom or move a more active child to the rear of the seating areas. As always the puppeteering is enchanting to watch in its subtle nuances and elegance. 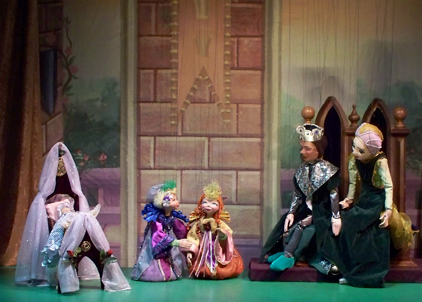 The magic of bringing these puppets to life goes hand in hand with the fairy tale experience. It is amazing just how much realism and character traits can be revealed in this art form. The Queen of the Fairies, though only seen briefly on-stage and has very little movements. She floats in and out and really only moves her hand with a magic wand, yet the detailed mannerisms in the performance create something majestic. One common trait with all Puppetworks productions is generally an animal that has some striking realistic movements and attitudes. In Sleeping Beauty, Aurora’s little dog Pippin wags his tale, jumps on the furniture and yelps to the delight of both young and old in the audience. The lobby is very small and the ticketing procedure requires advanced e-mail reservations. If you do not receive a confirmation e-mail from them, after you reserve, it would be wise to follow up with a second e-mail or phone call. The payments are cash only, so make sure you make an ATM run before going to the show. The lobby and seating areas are small, and it feels even smaller especially during the colder months when everyone has extra winter clothing. So it would be best to leave the extra-wide double stroller at home and pack as light as possible. Seating in the theater is general. The front area is open for floor seating for younger members of the audience, with benches on the sides and back of the auditorium. It is an intimate space, so if you decide to check your e-mail or text on your Smartphone during the performance, everyone can see you (hint, hint). The theater is sandwiched between Prospect Park and the smaller playground at Washington Park, so there are ample places to go and run around after sitting through the show. There are plenty of coffee shops and eating establishments in the neighborhood as well. Sleeping Beauty will be playing Saturdays and Sundays until March 29 with matinees at 12:30 pm and 2:30 pm. There also will be special shows during Presidents’ Week, February 16-20, at the aforementioned times. The Theater is located at 338 6th Ave, which is on the corner of 6th Ave and 4th Street, Brooklyn. It is a little bit of a walk from either the F & G subway stop at 7th Ave and R stop at 4th Street. By bus, patrons can take the 61, 63, 67 & 69 Brooklyn Bus lines.